You might remember that Team Meat, two-man studio behind uber-tough platformer Super Meat Boy, was working on a mad science cat breeding sim, Mew-Genics. Moral of the story? Cats are gross, but awwww kitty! Now, though, it's on hold in favor of a new Meat Boy game—for phones (and Steam). 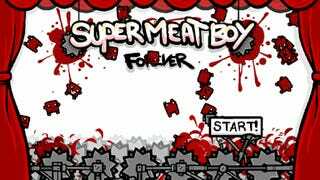 The new game is called Super Meat Boy: Forever. Contrary to what you might expect (or fear), however, it's not an endless runner or anything like that. Edmund McMillen wrote a big blog post about what it is instead. - SMB:F will feature a full story, 6 chapters, and double the bosses the original game featured. - SMB:F is not an endless runner, but will feature an endless mode with online high scores and daily runs. - SMB:F will feature a full fledged dark world featuring dark warp zones, bosses, new playable indie game characters and more. - SMB:F will feature a vast randomly generated level structure that ensures a totally new play experience with each death. - SMB:F is only 2 months into development, but as you can see things are moving pretty fast. Sounds pretty solid, honestly. Unfortunately, this means Mew-Genics is on hold for the time being—until Super Meat Boy: Forever comes out "sometime" next year. It's kind of a shame because the world has—by my approximation—enough mobile platformers and platformer-like games to last it literally forever, but not nearly enough games about vaguely horrifying cat science with rockabilly soundtracks. Oh well, though. We're getting both in the end. We just have to be patient. I, for one, plan to pass the time by buying a cat and exposing it to preposterous amounts of rockabilly. For science.